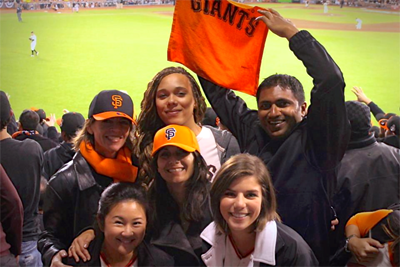 On October 24, the Spritz team rallied in the spirit of San Francisco pride, and went to the first game of the World Series at AT&T Park. Decked out in Giants gear and twirling our rally towels, we remained standing for just about the entire time, cheering loud enough for Hunter Pence to hear us from the outfield. When Pablo hit his first of three homeruns just rows away from us, the stands went absolutely wild. The air buzzed with electric energy throughout all nine innings. We made friends with fellow fans, giving high-fives every time our team got a run or base hit. Three games and one sweep later, the Giants secured their spot as the 2012 World Champions and were welcomed home with a victory parade through the city by an estimate of over one million fans. During and after the game, we shared our photos and videos with friends on social media, and even included some of it in marketing efforts for our clients in sports related industries. It’s a great feeling to be able to say that we were a part of this historic championship, it was truly a once-in-a-lifetime experience.